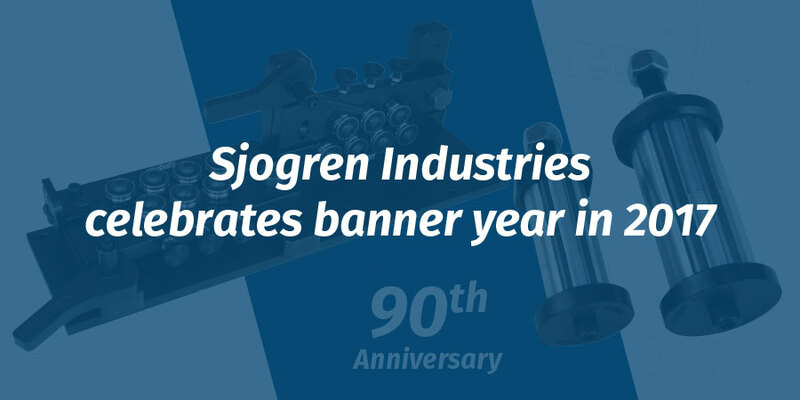 WORCESTER, MA _ Sjogren Industries celebrated its 90th Anniversary in 2017 by continuing its legacy of innovation in the wire tooling industry. In 2017 the company launched two new product innovations, expanded its workforce, and introduced a new preventative maintenance program for grooved rolls. In the past year, the company delivered both the Static Dancer Roll (SDR) and the Pivot Bar (PB) Series. Backed by a year’s worth of engineering and Sjogren’s 90-year history of innovation within the wire and cable industry, the PB Series provides a simple, modular design for wire straighteners. The PB Series maximizes efficiency with a design that minimizes space and set up time while eliminating the need for complicated and costly base plates for mounting. The PB Series comes with grooved rolls and precision ball bearings and available digital readout adjustment capability. Sjogren Industries, a leader in the groove roll market, also introduced its Preventative Maintenance program for straighteners and groove rolls designed to keep product lines running and minimize downtime, all while increasing productivity and profits. Sjogren has put together a recommended maintenance schedule based on the type, material, and usage of each of its clients’ particular rolls. Also in 2017, the company expanded its workforce with a series of strategic hires. Bob Elinoff has been appointed to Inside Sales, Justin LaPointe was named Customer Service Representative and Kevin Monroe was added to the Purchasing department. In addition to these appointments, Sjogren Industries has named Art Williams as their manufacturers’ agent in the Southeast Region of the United States. Williams brings years of experience in the wire processing industry and will provide a direct link to Sjogren customers in the region.